12F675 tutorial 5: Logging LM35DZ temperature to PIC internal EEPROM. 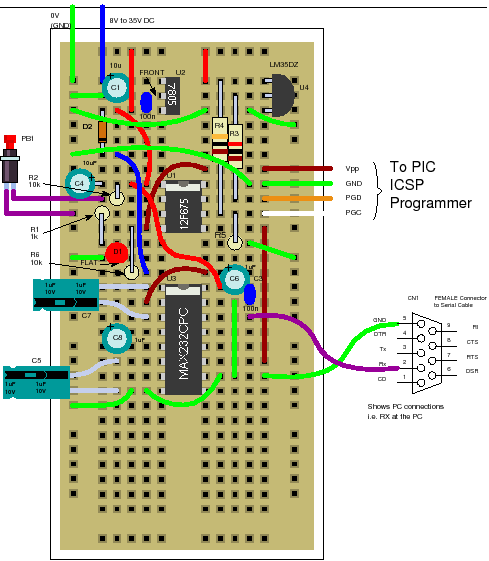 12F675 Tutorial 5 : A Temperature data logger using PIC EEPROM. EEPROM is useful for storing long term data such as data logger information and this PIC microcontroller EEPROM project saves the temperature from an LM35DZ IC to the PIC's internal long term data storage area. The project follows on from the last project using the virtually the same hardware. It stores temperature readings internally at regular intervals until full and after this it turns on the LED. The LED is really just for showing that something is happening and in a real data logger you would not use it. Note: This project is not optimized for power consumption so the best way to use it is powered from a power block. The current consumed is about 13mA (LED off) 16mA (LED on at end). If you want to use a battery use a rechargeable PP3 and do not attach the LED. The 12F675 may not the best PIC microcontroller to use for low power data logging and a better choice would be the 16F88 as it can change its internal oscillator on the fly going into slow (current saving) mode. But you could use the 12F675 with a slow external 32kHz crystal. At every ADC reading the LED is flashed briefly and when you select a 500ms reading interval you can see the readings being taken. When 64 readings are accumulated the LED is lit permanently - showing that the data store is full. Note: For this chip you only get to store 64 results as you need to store an unsigned integer for every ADC result and this takes 2 bytes so 128 Bytes/2 = 64 results. You can hit the button at any time and the contents of the EEPROM will be read from the internal EEPROM and transmitted to the PC via the serial port. To erase the internal EEPROM hold the button and cycle the power - this flashes the led 6 times indicating erase (normal startup flashes the LED 3 times). The solderless breadboard and circuit diagram are nearly the same as used in the previous project so if you have already built it you don't need to do any more. Just add the blue wire, D2 and R6. Note that the switch shown below is just a blue wire above. Either leave the blue wire where it is to hold the input, at pin 4, high or move the top of the blue wire to ground (0V - green wires at top left - on the left of the solderless breadboard) to set GP3 (pin 4) low. Note: The diode stops the programming voltage conflicting with the 5V power supply - reversed biased when the high programming voltage is present. Setting GP3 low causes a reading update rate of half a second (for debug) while setting it high causes a reading update rate of approximately 30 minutes. So for the full 64 readings you get temperatures measured and stored every half hour over a 32 hour period. Note: The measurement time is not calibrated so it won't be exactly 30 minutes. Note: The circuit/software is not optimized for power usage so you should use a power block to give the circuit power otherwise a battery would be drained fairly quickly. Again the Soft USART (transmit only) described in Tutorial 3 is used and internal MikroC routines are used to get data from analogue input (AN0) and for reading from and writing to the internal EEPROM. At start up the led is flashed three times. If you hold the button at start up the LED is flashed six times and the internal EEPROM will be erased ready to start logging the temperature again. As mentioned before setting GP3 high causes the measurement interval to be approximately 30 minutes whereas holding it low causes a half second measurement interval (for debug). Note the diode D2 is to stop programming voltage conflict during development. If you just program the 12F785 and then put it permanently in a separate circuit with no ICSP connection then D2 and R6 are not required - so you could connect pin 4 to 5V for half hour readings. Once the internal EEPROM is full up no more readings are taken and the LED is turned on permanently. Pressing the key at any point transmits the EEPROM data to the serial port for display/use on the PC. The software continuously gathers temperature readings and as before it transmits the result to the serial port (this time as a centigrade reading) and it also stores the reading in the EEPROM. It can gather a maximum of 64 readings (half the size of the internal EEPROM). After this it stops recording and even if the power is lost the readings will remain stored in the EEPROM. For debug the led is flashed briefly to show a data capture. Note: Vdelay_ms is used throughout and although it is less accurate it saves space (this is a 'variable' based delay routine as compared to delay_ms which generates code for each instance more accurate but more code!). The rest of the action happens in main() in an infinite loop. It gets a reading,sends it to the serial port and then stores it in EEPROM. It then flashes the LED briefly checks the key state, then checks to see if all data is gathered and then waits for a delay (the length is determined by the state of GP3 - pin 4) either 30 minutes or 0.5 seconds.